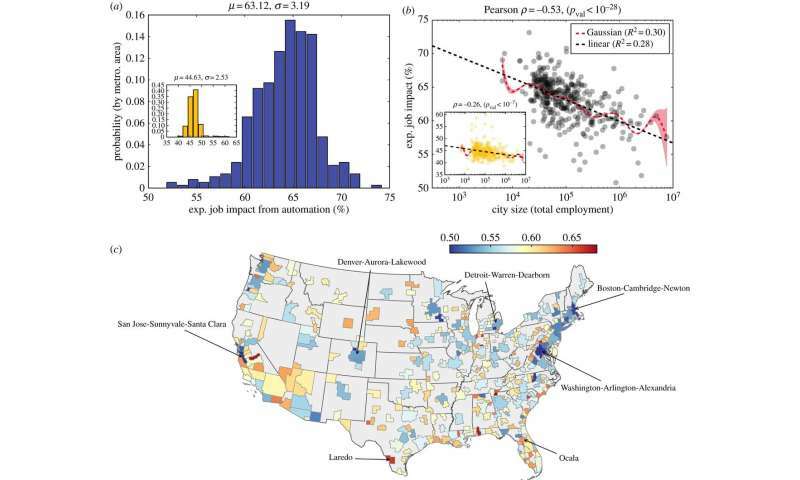 A small team of researchers from MIT and Northwestern University's Kellogg School of Management has found evidence that suggests automation will cause more job loss in smaller cities than large cities. In their paper published in Journal of the Royal Society Interface, the team describes their analysis of prior research to discern which sorts of jobs are most likely to be taken over by machines, and how it might apply to cities. As technological advances march ever onward, increasing numbers of jobs once held by humans are being taken over by machines or robots—the automotive industry is a prime example. Robots now play a major role in manufacturing plants. But which sorts of workers need to worry about losing their jobs to robots, and which are relativity safe? That was what the researchers sought to learn. The researchers started by studying results found by other teams who have looked at which sorts of jobs are most amenable to mechanization. Unsurprisingly, they found that at least in the near future, those jobs that are relatively simplistic are those most likely to be supplanted by a machine or robot. They note that jobs such as waiter, salesperson or usher are likely to be automated because the skills required are reasonably easy to program into a machine. On the other hand, jobs that require personality or creativity appear much less likely to be assumed by a machine or robot. We will not soon be seeing robot lawyers or school teachers, they predict. The researchers then applied what they learned to sociology and geography—which people living in which areas are more or less likely to see job losses due to machination? After comparing the types of jobs that are typically available in different places, the researchers found that smaller cities (and towns, presumably) are more likely to lose jobs to automation than large cities. This, they suggest, is because jobs in smaller cities tend to be more labor-intensive and require less skill. Cities, on the other hand, offer far more sophisticated positions, many of which are not likely to be automated any time soon.